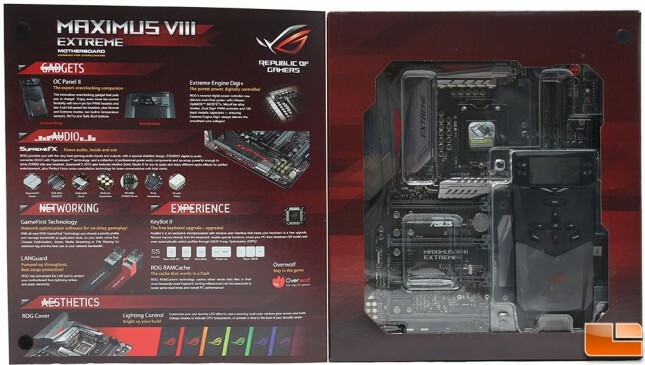 ASUS sticks with it’s basic packaging for the Maximus VIII Extreme, there isn’t anything flashy about it. 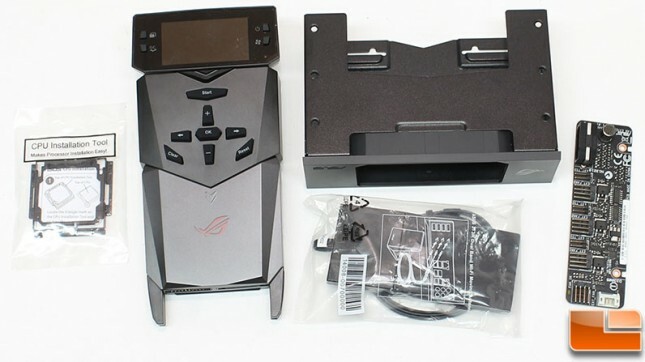 The front of the box just presents the basic information with the ASUS branding, model and the key chipset features it supports. The only feature that ASUS lists not related to the chipset features is the OCPanel II bundle. 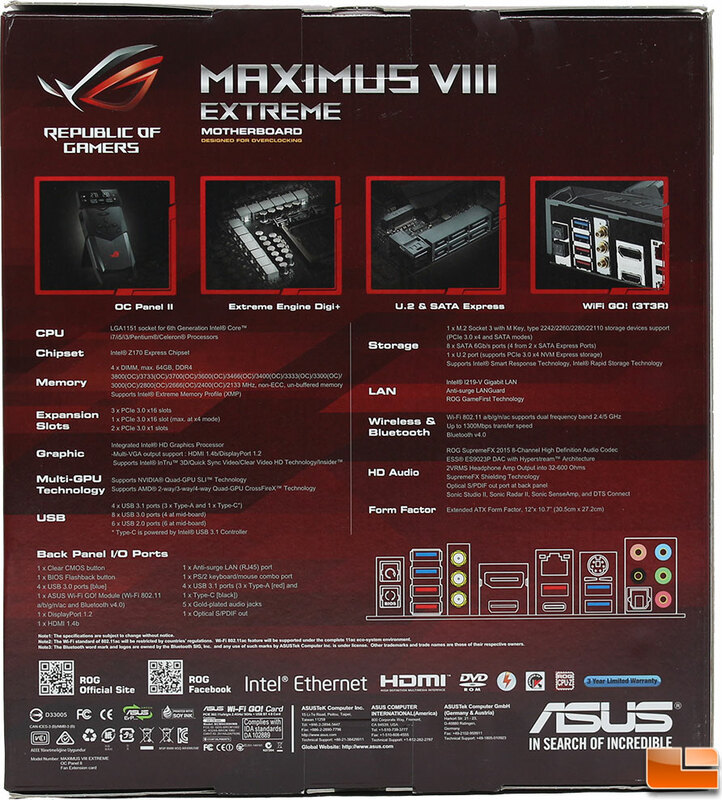 If you happen to need to know everything about the Maximus VIII Extreme, ASUS has that covered on the back of the packaging. Here ASUS lists out the specifications, provides a view of the rear I/O panel and gives a glimpse of four other features. 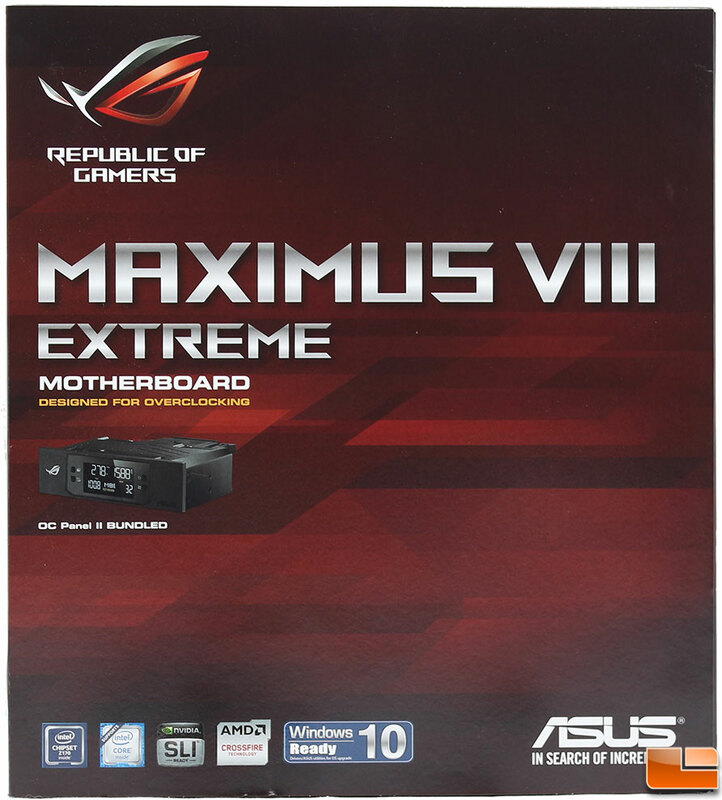 Opening the box flap reveals more information on the Maximus VIII Extreme motherboard, that includes information about the OC Panel, audio, networking, aesthetics and several other advanced features. On the other side, we see that ASUS has packed the Maximus VIII into a form fitted box, that is held in place with a clear plastic cover. This provides the user a nice view of the motherboard, and the OC Panel II. 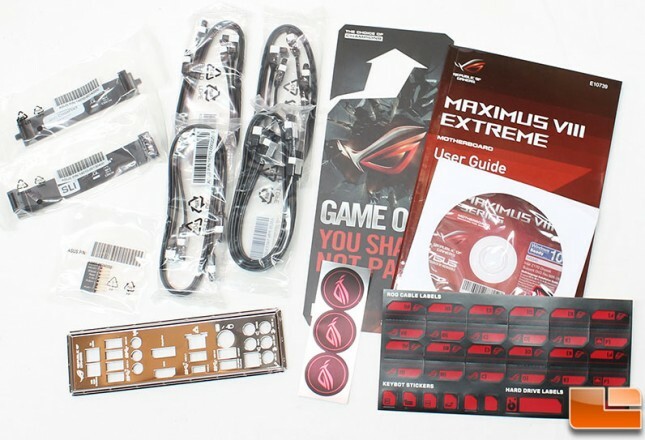 When you purchase a top of the line motherboard, you should expect a top of the line accessory pack; which of course ASUS has provided. Included in the accessories are the standard rear I/O port shield, user manual, install disc, CrossFire and SLI bridges, eight SATA cables, ASUS front panel Q-Connector, ASUS ROG door hanger, and various labels. In addition to the standard accessories, ASUS includes additional accessories with the Maximum VIII Extreme, this includes the OC Panel II, OC Panel 5.25″ bay adapter, WiFi 3T3R antenna, fan controller and their new CPU installation tool.